Strengthening category 3 Hurricane Ophelia is now the most powerful hurricane so far east ever recorded and it is causing mini record heatwaves all over Western Africa, the UK and Ireland and Western Europe. The government of the Canary Islands has issued a heatwave alert for the holiday hotspots of Fuerteventura and Lanzarote. High temperatures in the range of 34 to 38 C, 100 deg F are being forecast. The 112 emergency services have issued advice to holidaymakers to help them cope better with the unseasonably high temperatures. Meanwhile, parts of the UK and Western Europe will see temperatures of 25 deg C, almost 80 deg F on Sunday and Monday. After weakening Hurricane Ophelia is expected to make landfall early Monday along the south coast of England. Despite losing its tropical characteristics, Ophelia will still be a powerful windstorm as it tracks near or over western Northern Ireland and western Scotland late on Monday into Tuesday, with wind gusts up to 90mph. 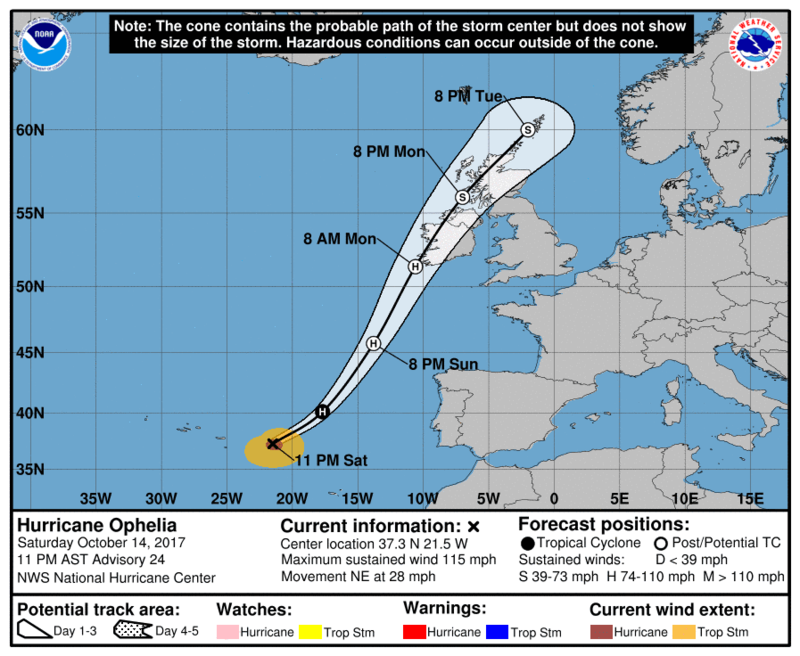 Ophelia is heading North East and is expected to hit the UK early Monday after a weekend of summer temperatures.